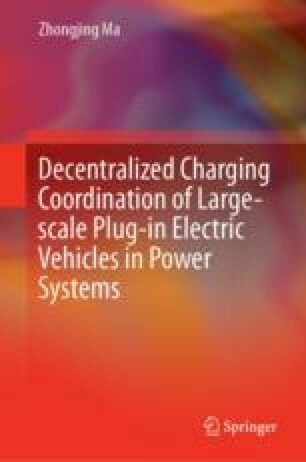 PEVs, as distributed energy sources, are promising to provide vehicle-to-grid (V2G) services for power grid, like frequency and voltage regulations, by coordinating their active and reactive power rates. However due to the autonomy of PEVs, it is challenging how to efficiently schedule the coordination behaviors among these units in a decentralized way. In this chapter it formulates the underlying coordination problems as a novel class of VCG-style auction games where players, power grid and PEVs, do not report a full cost or valuation function but only a multi-dimensional bid signal: the maximum active and reactive power quantities that power grid wants and the maximum per-unit prices it is willing to pay, the maximum active and reactive power quantities that a PEV can provide and the minimum per-unit prices it asks. We show the existence of the efficient Nash equilibrium for the underlying auction games, though there may exist other inefficient Nash equilibria. In order to deal with large-scale PEVs, in this chapter, it designs games with aggregator players each of which submits bid profiles representing the overall utility for a collection of PEVs, and extends the so-called quantized-PSP mechanism to the underlying auction games to implement the efficient Nash equilibrium.